For ab178846 Abcam recommends blocking in 3% milk for cleanest results in WB. Blocking with BSA gives slightly higher background. within Mouse Iba1 aa 100 to the C-terminus. The exact sequence is proprietary. WB: HL-60, THP-1, U937, RAW 264.7 and NR8383 whole cell lysates; Human, mouse and rat spleen lysates; Mouse testis and liver lysates. 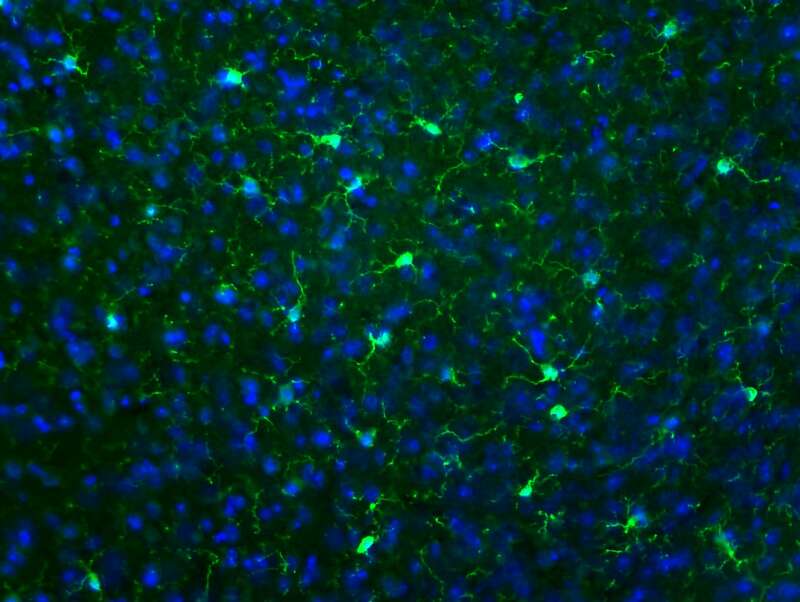 IHC-P: Human Cerebral cortex, human hippocampus; Rat and mouse normal brain tissues. 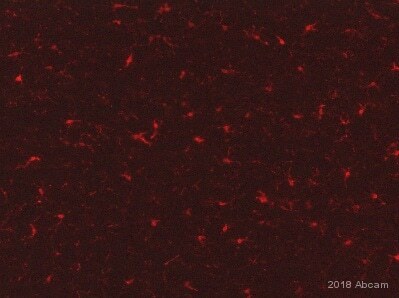 Flow Cyt: U937 cells. Our Abpromise guarantee covers the use of ab178846 in the following tested applications. WB 1/500 - 1/2000. Detects a band of approximately 10, 15 kDa (predicted molecular weight: 17 kDa). Abcam recommends blocking in 3% milk for cleanest results in WB. Blocking with BSA gives slightly higher background. 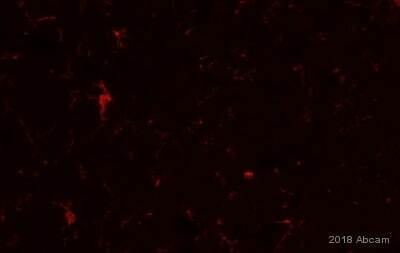 IHC image of Iba1 staining in rat normal brain formalin fixed paraffin embedded tissue section, performed on a Leica Bond™ system using the standard protocol F. The section was pre-treated using heat mediated antigen retrieval with sodium citrate buffer (pH6, epitope retrieval solution 1) for 20 mins. The section was then incubated with ab178846, 1/2000 dilution, for 15 mins at room temperature and detected using an HRP conjugated compact polymer system. DAB was used as the chromogen. The section was then counterstained with haematoxylin and mounted with DPX. Flow cytometry analysis of 2% paraformaldehyde fixed U937 (human histiocytic lymphoma cell line) cells labeling Iba1 with ab178846 at 1/160 dilution (red line). Secondary antibody used is a goat anti rabbit IgG (FITC) at 1/150 dilution. The isotype control is rabbit monoclonal IgG (black line). 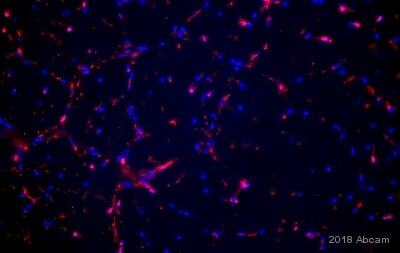 The unlabeled control is cells without incubation with primary and secondary antibodies (blue line). 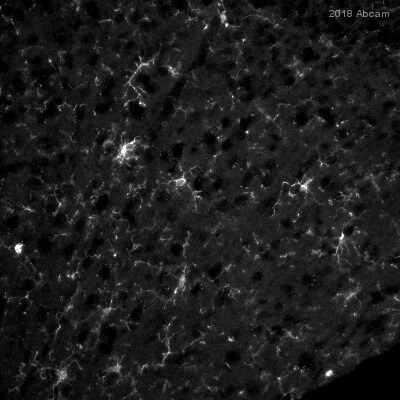 IHC image of Iba1 staining in mouse normal brain formalin fixed paraffin embedded tissue section, performed on a Leica Bond™ system using the standard protocol B. The section was pre-treated using heat mediated antigen retrieval with sodium citrate buffer (pH6, epitope retrieval solution 1) for 20 mins. The section was then incubated with ab178846, 1/2000 dilution, for 15 mins at room temperature. 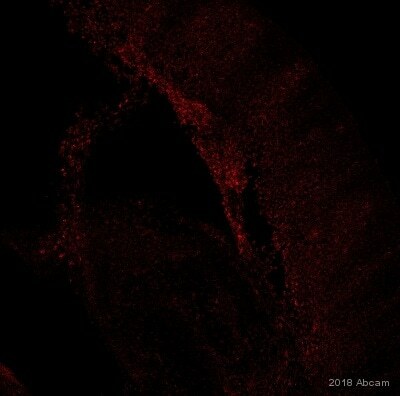 A goat anti-rabbit biotinylated secondary antibody was used to detect the primary, and visualized using an HRP conjugated ABC system. DAB was used as the chromogen. The section was then counterstained with haematoxylin and mounted with DPX. Abcam recommends blocking in milk for cleaner blots with reduced background, in comparison to BSA. This blot was produced using a 4-12% Bis-Tris gel under the MOPS buffer system. The gel was run at 200V for 60 minutes before being transferred onto a nitrocellulose membrane at 30V for 70 minutes. The membrane was then blocked for an hour before being incubated with ab178846 (anti-Iba1 antibody; 1/500 dilution) for 18 hours at 4°C. Antibody binding was detected using ab97040 (HRP-labelled goat anti-mouse IgG) at 1:50,000 dilution for 1 hour at room temperature and visualised using ECL development solution ab133406. 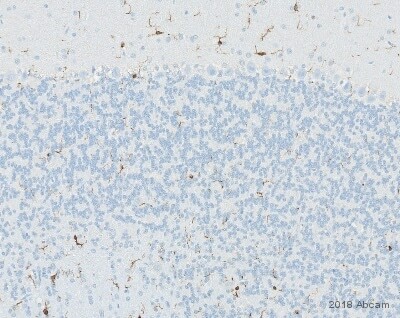 IHC image of Iba1 staining in human normal hippocampus formalin fixed paraffin embedded tissue section, performed on a Leica Bond™ system using the standard protocol F. The section was pre-treated using heat mediated antigen retrieval with sodium citrate buffer (pH6, epitope retrieval solution 1) for 20 mins. The section was then incubated with ab178846, 1/2000 dilution, for 15 mins at room temperature and detected using an HRP conjugated compact polymer system. DAB was used as the chromogen. The section was then counterstained with haematoxylin and mounted with DPX. 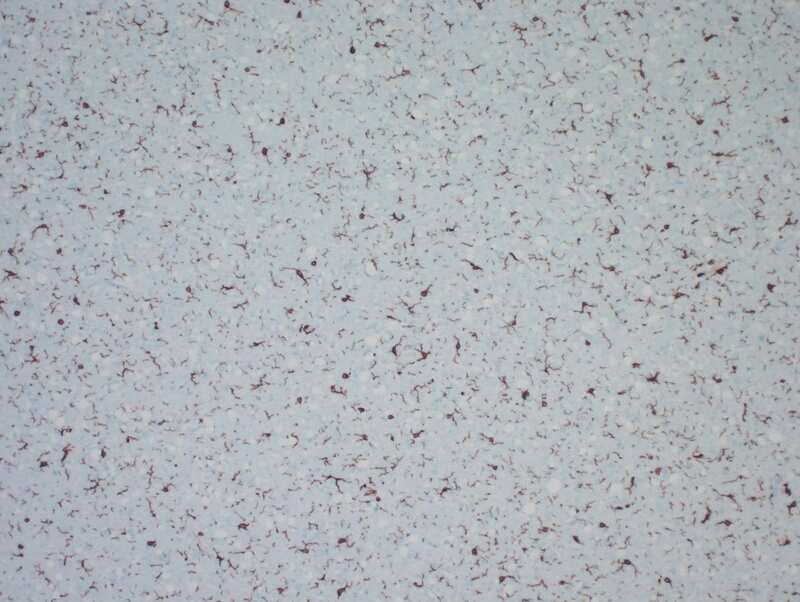 Immunohistochemical analysis of paraffin-embedded Human cerebral cortex tissue labeling Iba1 with ab178846 at a 1/2000 dilution showing cytoplasm and nuclear staining on Glial cells. Counter stained with hematoxylin. Prediluted HRP Polymer for Rabbit/Mouse IgG was used as the secondary aantibody. Negative control also shown. Observed band size: 10, 15 kDa why is the actual band size different from the predicted? Based on sequence analysis, ab178846 recognizes 2 isoforms with the predicted MWs of 17KDa and 11KDa, respectively. Publishing research using ab178846? Please let us know so that we can cite the reference in this datasheet.